You are here: Home > List of issues > 2018 > Central European Journal of Communication Volume 11 No 1(21) Fall 2018 > BOOK REVIEW: Eric Freedman Robyn S. Goodman & Elanie Steyn (eds.) (2018). 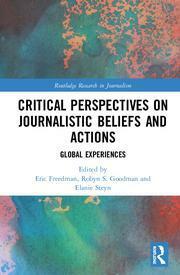 Critical Perspectives on Journalists’ Beliefs and Actions. Global Experiences. London: Routledge pp. 248 ISBN: 1-351-66436-0 978-1-351-66436-3. BOOK REVIEW: Eric Freedman, Robyn S. Goodman & Elanie Steyn (eds.) (2018). Critical Perspectives on Journalists’ Beliefs and Actions. Global Experiences. London: Routledge, pp. 248, ISBN: 1-351-66436-0, 978-1-351-66436-3.